UV systems require a UV Ballast or controller to power and monitor the UV lamp. 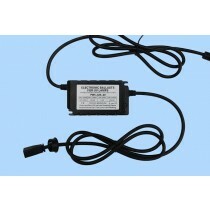 Some of these smaller cheaper ballasts have just a red and green LED light and an audible alarm which will sound when the lamp comes to end of its life or fails. The better quality Ballast/ Controllers have additional features to manage more expensive systems. They are generally Gel filled because moisture over time can cause internal corrosion especially if located near the sea. These ballasts will have digital displays that countdown the days since the UV Lamp was replaced last. The will also display fault codes and in some cases monitor a light sensor attached to the UV Chamber. This sensor monitors the intensity of the UV light emitted from the lamp and travelling through the water. If the lamp deteriorates or the water timidity is poor then the ballast/controller will offer a fault code indicating that this is occurring. The visual fault code is usually associated with an audible alarm. Although currently these systems are not externally monitored there is progress in this field to offer off site monitoring via WiFi. 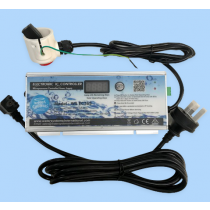 Because electrical equipment near water can lead to a hazard, a quality system will provide additional protection in the way of an outer IP water resistant box and a built in RCBO and surge protector. Systems displayed on this website come with these protection devises.